Dagmar Cyrulla’s paintings, showing at Melbourne's James Makin Gallery, seem to bear witness to humanity at its most characteristically vulnerable. It’s entirely fitting that, when we look at her quiet suburban narratives we wonder: about what has occurred; what might be about to happen; what we should feel for the protagonists. She captures that most essential element of the human condition. Doubt. We humans are uncertain of our futures, about one another’s motives and about whether seeing really is believing. Cyrulla’s paintings are sometimes fragile strokes that try to piece together things we can’t understand, her brushstrokes are the like the smear of recall, the half remembered last whereabouts of the victim. At times they feel like crime scene reconstructions, at others they are memories of the moment just before we couldn’t go back. Then again the works might also be dispassionate reportage on the banalities of every day life. That uncertainty of intent makes them compelling. 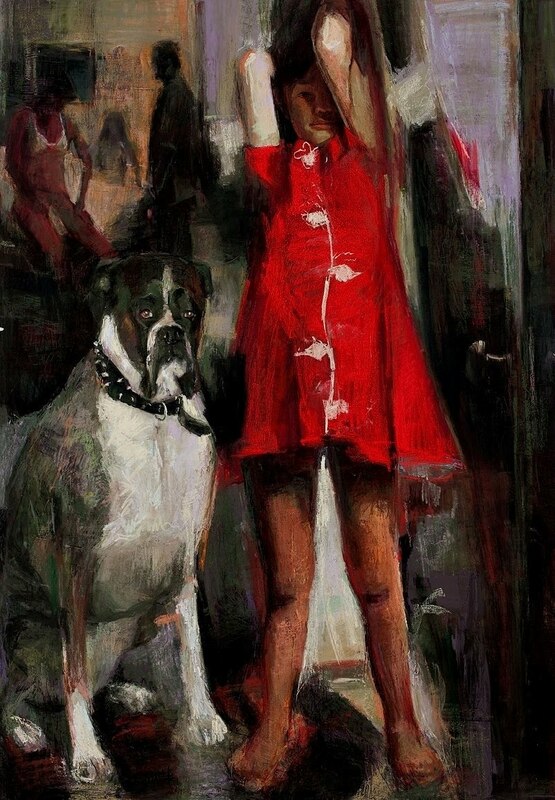 These paintings feature adults and children reduced to their essentials. Clothes give little away, décor is functional, props are rarely more than vases of flowers. Yet amongst this a hand might be about to form a plea or a fist, a wet red smear of lip might be smiling and from that gesture alone the whole canvass is imbued with a sense of import. Cyrulla shows action and reaction rather than cause and effect, in doing so she presents characters whose own existential crises remain hidden. That alone engages us with the paintings in a powerful way, we look at the human and project our own experience. These are ambiguous scenes depicted ambiguously, they sometimes feel illicit, often powerfully sexual, but again and again those responses are magnified because of our own uncertainty. Most of the action in these paintings takes place in our own minds, which is why they are so very memorable. Ambiguity keeps Cyrulla on the right side of voyeurism. We may be watching a woman dressing after an afternoon tryst with a lover, or we might not. If the circumstances were more explicit we would be plunged into judgement. Instead the uncertainty reminds us of the frailty of human experience, of the difficulty of our own decisions and desires. Cyrulla manages to give us a tender distance that manages to retain both complexity and emotion. At first sight Cyrulla’s painting brings to mind the work of Eric Fischl, the American artist whose suburbs and hotel rooms present a sleazier voyeuristic update of Edward Hopper. 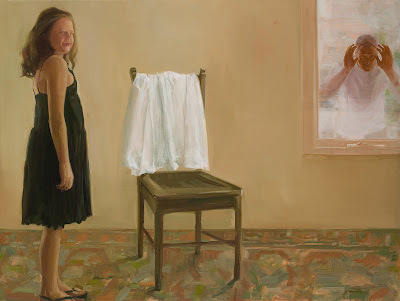 The comparison falls when you see the amount of cultural baggage Fischl loads his paintings with, they are much closer to a closed meaning that the work here. 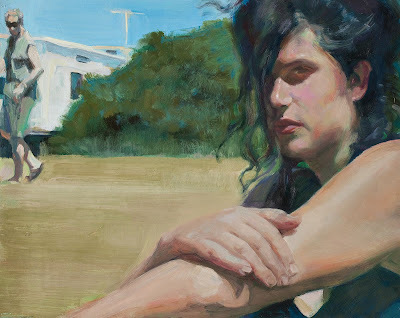 If Fischl’s work has a writerly analogue it’s Bret Easton-Ellis if Cyrulla does it’s Raymond Carver. The moment captured in Cyrulla’s work often hangs like a non-sequitur and it’s no surprise that she evokes literary precedents. There’s something of the spareness of Carver in there, her economy of palate reminds one of his sentences. There’s no rush to sneer or judge as people are on the verge of the banal, the cruel or the mistaken. The careful and considered tonal palate stops things straying into sensationalism. It’s a rare thing in any art form to present humanity without the hysteria, a rare and worthy thing. It is easier to be reminded of Degas precision in framing meaning or the tender colour blocks of Bonnard’s obsessive repainting of his wife as she bathed. In both cases, as with Cyrulla, the impression left is far stronger than the specifics recorded on the canvass. Cyrulla’s hidden eyes, smudged skin and mid-air gestures show rather than tell, this makes the work powerful as it invites rather than dictates response. In terms of art criticism both Degas and Bonnard tend to be noted for their formal qualities, but for the general viewer their popularity comes from a link between that and their human content. Like both of these Cyrulla captures the fleshiness and the ineffable spirit of the human through a style that favours impression over precision. We look at her paintings and feel them, as we see she understands that we are all messy, imprecise, flawed creatures in search of meaning and respect. The characters in the paintings inhabit unsettling psychic environments. Doors and windows feature heavily with all their intimations of parting and arrival, voyeurism and display. The interiors are not overly symbolic or detailed, they take on character through colour. Kitchens are reduced to tobacco wood smears and carpets swirl dizzily beneath our feet. Showhome interiors become faintly nauseous with touches of green and yellow so that sometimes the events might be taking place underwater, with all the struggle and inevitability of drowning. It’s erroneous to imagine that dramas are always played out in the shadows in a land of vast blue skies, the cruel light of day bears witness to as many pivotal moments. Cyrulla’s use of light can be shocking, the harsh whitening blues of the summer sun make her feel a very Australian painter. It is also the naturalism, and often softness, of the light that adds emotional depth to the paintings, they create real spaces rather than noirish film sets. Cyrulla’s characters retain the dignity of mystery. They are not painted to the point of photo-realism nor are they loaded up with cultural signifiers that signpost a particular lifestyle. The wonder and danger of painting is that it can tell us too much about its subject, a problem that often pushes contemporary narrative painting into kitsch. 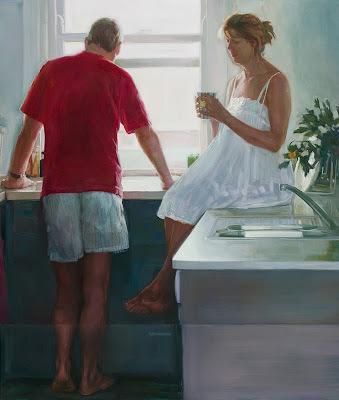 The painter here understands that it is precisely our inability to know one another that fascinates, that the fact that we rarely give out our all to the world is the essence of human drama. There is something respectful in the way that Cyrulla handles characters by showing us only their essentials she allows them to keep hold of themselves. The best art will always find a relationship between form, what’s on the canvass, and narrative, what’s in our minds. Dagmar Cyrulla paints profound things with a restraint that we can all recognise. It’s the restraint of survival and coping, of getting on with it, of human beings living. In these paintings Cyrulla has created something touching and universal.